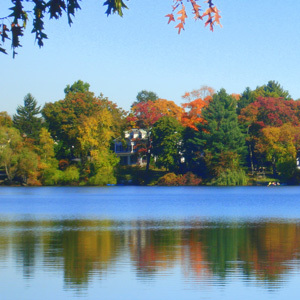 Crystal Lake is a “great pond.” The “law of great ponds” comes from 17th century common law. It’s purpose is to ensure equality in the use of large areas of wet land. The lakeside building or “Old Bath House” on Rogers St. was built in 1930 at a cost of about $35,000. It is a Spanish eclectic style with art deco features. The long rectangular building was added to the “Old Bath House” in the 1970s. Currently restoration/re-creation of these buildings and surrounding area are planned. Before it became popular as a swim facility, in the mid 1800’s, small industries were located at the site of the “Old Bath House”. This was about the time the railroad first came to Newton Highlands and when there was a large increase in the Newton Highlands population. Ownership of the Lake and surrounding land changed several times in the past few centuries and so did its name. Previous names were Hayes Pond, Wiswall Pond, Baptist Pond and Silver Lake. It became Crystal Lake in the mid 1800’s, corresponding with the time of the ice harvesting business in New England. This ended with the advent of electric refrigeration around 1915. In the early 20th century, the most popular sport at Crystal Lake was ice skating. Warmer winters, stricter safety codes for ice density and city budget constraints resulted in ice skating not being possible later in the 20th century. Currently, perhaps the most popular use of the Lake is for walkers, strollers, joggers and nature lovers. Swimming, fishing and boating also have a long history of being enjoyed at Crystal Lake. The main public open spaces at Crystal Lake include Cronin Cove, Levingston Cove and the newest area, the Crystal Lake Park. Cronin Cove was named for Crystal Lake resident Joe Cronin, Hall of Fame former Boston Red Sox player and manager (1935-47) and former president of the American League (1959-73). Levingston Cove was named for Louise Levingston, a Lake neighbor since the 1950s who was honored in 1982 for her devoted caretaking of that Cove. The land for the new Crystal Lake Park was acquired through eminent domain in 2006, following many years in which the private residence at this site had deteriorated. An easement connecting the Levinston Cove and Crystal Lake Park was acquired in 2008.